Yep, that blue light is blinking and I made it happen. I’ve been hard at work since I got my free STM32F0-Discovery board in the mail. Most recently I put together a starting template for building STM32F05x project on Linux. You’ll still need to install your own tool chain (I’m using the Code Sourcery G++: Lite Edition), but this makes it a snap to compile your projects with support for STM’s peripheral libraries. As for programming, you may remember that I added support for writing to RAM in the stlink project. I’ve wasted spent a ton of time trying to get support for writing to Flash into that project. It’s just less of a hassle to use stlink than it is to work with OpenOCD. But I’ve really hit a wall getting the flash loader code to work. If you want to check out what I’ve done so far in that area I committed a very messy branch (see the commits for what code changes I’ve made). In the mean time you can use OpenOCD to write images compiled with the template to your device. I included the ‘make program’ option in the Makefile to do this from command line. If you need help compiling OpenOCD check the readme in the template repository. That’s awesome Mike. Projects on the Discovery kit are showing up slowly. Also, I’m trying to build a small ARM community around all the Raspis, Discoveries and Beagleboards so it acts for a one stop place for all things arm. You are welcome to say hi. Continue your awesome tutorials. I will definitely check out your forum akismet, but is there another page with good tutorials and examples (especially) for STM32 stuff? Hi Mathias, We are still building the community up slowly. There is a discovery kits subforum if your interested. The board is fairly new and will take some time to catch on. I’m sure there will be a HAL soon enough. Unsure why my name came up as “akismet”, I’ll change it in my profile later. really? that’s the length sti wants me to go? my free board will sit in a closet for way longer than i anticipated. …forgot to add, that despite the extra hardware, this one seems more interesting than using code sorcery shenanigans. This isn’t a too terribly nice format, but I don’t have much time as of late to write a full tutorial. Hope this helps you out. 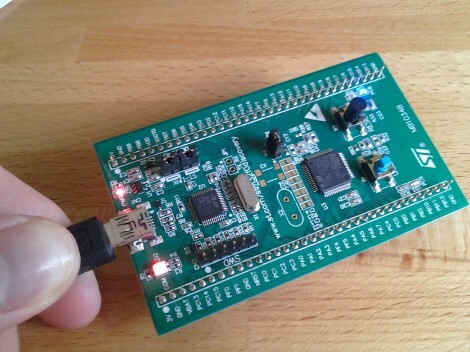 On a related note, does anyone know how to buy one of those boards without paying 20 € for shipping? ** using the Atollic TrueSTUDIO(R) toolchain. Well isn’t that just FANTASTIC? Thanks for bringing it to my attention. I’ve deleted the file from the repo history. Not sure how to replace it but I’ll start learning about how to write one myself I guess. It’s unfortunate that STM is distributing a file with that much restriction on it along with their much-less restrictive peripheral libraries. Don’t distribute the file but rather write instructions on how to modify the existing file a user would have if they registered True Studio . Dumb restriction but it can be bypassed. Good work on figuring it out. STM32 is a very good family from hardware perspective .. lots of power at a cost similar to the one for an 8 bit microcontroller. that’s great work. I cleaned it up and now it fits perfectly into my own little project. But is there any way to compile C++ instead of C code? As long I compile it with a .cpp-extension, the LED doesn’t light up. In C++ probably your interrupthandler is not called due to the name mangling that happens with c++. just make it extern “C”. just a guess, i encountered the same. I found these products to be a great deal. The Lida lida daidaihua makes me less hungry and the fat burn is helping me wipe out my flab. The instructions that came with it told me that getting my eating in check was necessary for a winning approach. I really took that to heart and have owned a lot more discipline when I am eating and the hoodia makes all that easier. I am doing sit ups and taking these products every day and so far, My flab is going away. I dont own a working scale but more than likely that things are improving.